Photovoltaic (PV) collectors absorb light energy from the sun for the generation of electricity. The power generated can be fed back into the main electrical grid, or be used as a self-contained system with batteries. The need for electricity in remote areas prompted the growth of the PV industry over the past 30 years. Initially, the main purposes were to power items used in space exploration and to power cottages and houses that did not have access to the main power grid, usually located in remote locations. This prompted the growth of systems that utilized a series of battery banks for storing the electricity. These systems are still being employed today with more efficient batteries and other equipment. Today, systems generating electricity that feed into the main electrical power grid are becoming more common and are growing in popularity. Individual homeowners now have the opportunity to take control and effectively generate their own power, thus lessening the burden and dependence on fuel sources such as nuclear and coal. At the same time, it offers the homeowner financial benefits. The Green Energy & Economy Act (GEA) and the Feed-In Tariff (FIT) program were introduced in 2009 by the provincial government of Ontario. The GEA included several measures for incentives for renewable energies. As part of the GEA, it introduced the FIT program. The Feed-In Tariff program can be divided into two categories, the FIT program for electrical generation projects greater than 10 kW in size, and the microFIT program for electrical generation projects 10 kW or less in size. For information about the GEA, visit the Ministry of Energy's Web site. For microFIT rooftop systems, the homeowner/business owner is compensated 38.4¢ per kWh of electricity generated. To accomplish this, the system owner signs a contract with the Ontario Power Authority (OPA). The contract provides 38.4¢ per kWh for a period of 20 years. For microFIT ground-mount systems, the owner is compensated a lesser rate of 28.9 ¢ per kWh of electricity generated. The OPA is the organization that executes the directives of the Green Energy & Economy Act, including the FIT and microFIT programs. For information about the OPA, visit the OPA Web site. PV systems can range from 75 watts (W) to 10 kilowatts (kW) for the microFIT program. There is no “standard” size for a system. 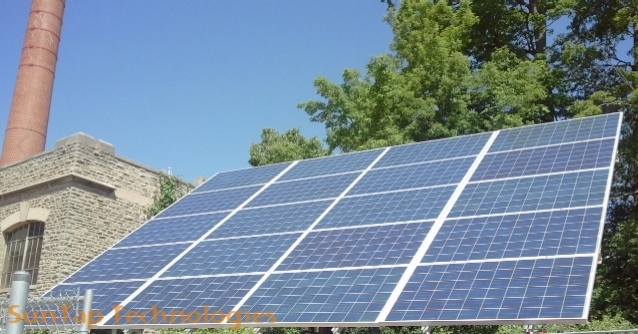 System sizes usually vary with the different manufacturers of the PV panels and inverters. For example, one manufacturer may offer a 190 W PV panel. Ten panels of this size would yield a system size of 1900 W – or a nameplate rating of 1.9 kW. A different manufacturer may offer a 175 W panel. Ten panels of this size would yield a system size of 1750 W – or a nameplate rating of 1.75 kW. Commonly, it is a good practice to value a system as to the cost per watt. It is best to have the PV panels facing due south to maximize energy production. Within a southeast to southwest will result in a minor drop in performance. Most residential homes have a sloped roof. Rooftop mounted systems on homes are usually mounted parallel to the roof surface of the house. Most commercial buildings have flat roof surfaces. Rooftop mounted systems on commercial buildings usually employ specialized racking to provide for the correct mounting angle of the PV panels. The Ontario Building Code requires a building permit to be obtained for installations that have a panel surface area greater than 5 square metres (m²). We provide a free consultation and site assessment to allow the homeowner to make an informed decision. We conduct an energy analysis using simulation software to predict a more precise amount of energy that could be generated, based on the installation variables such as orientation, tilt angle, and type of panel. We provide a complete breakdown of the installation costs. We guide you through the process with the OPA and your local distribution company to help you meet schedule targets. We assist with permit applications to meet the requirements of the Ontario Building Code and local municipalities. We can also arrange for any required roof inspections. We provide you a step-by-step guide to help you through the process. Copyright © 2015 SunTap Technologies Inc. All rights reserved.